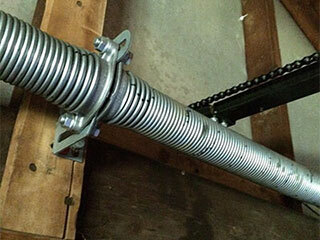 The springs in your garage door are some of the toughest you’ll find anywhere in your home. They need to be strong enough to take the weight and tension of your door, yet flexible enough to extend and relax thousands of times reliably and safely. Every spring needs regular maintenance and even then, has its limit. When your door springs need maintenance or replacement, it’s time to call in our professional technicians. The more you open and close your garage door, the more wear and tear your door spring will endure. Every spring needs regular maintenance checks and lubrication, but even so, at some point it will need to be replaced. How do you know what kind of spring to replace it with? How do you know what level of tension it needs or what angle is the best for maximum leverage? Firstly, the spring that is already installed on the door may not necessarily be the right choice for a replacement, or it might have been installed improperly. It might be the wrong type or outdated. Also, the weight and dimensions of your door will dictate exactly what kind of spring you need: its strength, length, diameter and durability. When our technicians arrive to inspect, service or replace your springs, we will bring the latest tools and the most up-to-date door parts that not only comply with current safety standards, but are also designed to match the dimensions and requirements of almost every type of door found in the USA. Make sure the door is balanced and working perfectly after any service or spring replacement. There are so many reasons to call our professional technicians for any garage door spring services you need!